Protameen Chemicals, Manufacturer and Distributor of Specialty Materials for the Personal Care Industry. PROTACHEM PEG & Specialty Esters have a variety of uses in personal care formulations as emolients, emulsifiers, opacifiers, humectants, solubilizers, binders for pressed powders and pigment dispersants. When added to cosmetic formulations, they reduce the greasy feel of oily components. Where applicable, Protachem Specialty Esters are available with purity that meets the National Formulary requirements. These are generally soluble in oils or organic solvents and dispersable or insoluble in water. They act as low HLB emulsifiers and thickners useful in emulsions. 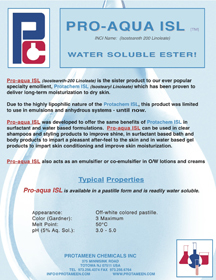 When combined with the Polyethylene Sorbitan Esters, they form stable emulsions. They find use in cleansing products (cold creams, cleansing lotions, etc.) 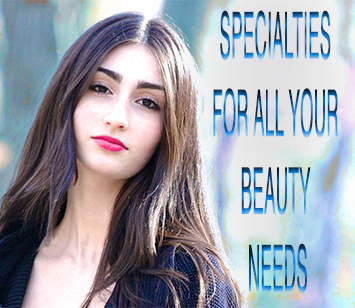 make-up, foundations, sunscreen products, lipsticks and emulsion products. These are generally soluble in water. they act as high HLB emulsifiers and thickners useful in emulsions. These nonionic surfactants used in personal care products as wetting agents, emulsifiers, solubilizers, conditioners and coupling agents. Used in various cosmetic and toiletries such as cream rinses, conditioners, bath oils, creams, lotions, deodorants, anti-perspirants and shaving products. The Proterics and are mild nonionic surfactants often used in place of the alkanolamides. They are used in baby cleansing products as well as other frequent use personal care cleansing products where low irritation is important. When used in combination with other surfactants, they build viscosity, boost and stabilize foam and have skin and hair conditioning properties. The Protamate series offer a wide range of HLB values making them useful as primary and auxiliary nonionic surfactants. Besides their emulsification properties, the lower molecular weight PEG esters are effective pigment wetters in make-up products and solubilizers for fragrance in various personal care products. The higher molecular weight PEG esters act as viscosity boosters, opacifying agents and skin and hair conditioners for shampoos, cream rinses, lotions and creams. An important characteristic of PEG esters is that they are neither eye nor skin irritants and safe for use in baby products. The Protachems are useful in personal care products as non-ionic surfactants, emulsifiers, solubilizers and conditioners. Their resistance to hydrolytic degradation makes them particularly useful in aggressive formulations. Protaquats find use as anti-static agents in hair conditioners and creme rinses to eliminate “fly-away hair” leaving hair soft, manageable, tangle-free and easy to comb. Because of their quaternary structure, the level of preservatives may be reduced or eliminated depending upon the formulation. These are cationic in nature but the degree of ethoxylation increases, they become more non-ionic. Useful as emulsifers, anti-irritants in shampoos containing lauryl sulfates and lauryl ether sulphates, neutrlizing agents for acrylate thickners, anti-static agents, a foam booster and a mild detergent. These are non-ionic surfactants useful as wetting agents, detergents and emulsifiers with good stability in the presence of alkalies and acids. Used in bath additives, liquid soaps, cleansers, hair conditioners, colorants and make-up products. Extremely mild preservative-free detergent bases with high foaming power and foam stabilizing effects. Useful in syndet bars, liquid, cream and powder shampoos and cleansing products. The Fatty Esters are used in all types of personal care products as emollients, lubricants and solvents. They impart a dry, silky skin feel and reduce the greasy effect of oils and petrolatum. The Glyceryl Esters are excellent auxiliary emulsifiers and stabilizers, thicken emulsion systems and are excellent opacifiers, surfactants and emollients. Lanolin is a naturally derived product useful as an emollient, hair and skin conditioning agent and emulsifier. When reacted with ethylene and propylene oxides in various ratios, the resultant products have increased water solubility and perform as non-ionic surfactants. In water-based systems, especially cleansing products, they are substantive and leave behind an elegant feel. When lanolin is reacted with acetic anhydride, the product no longer behaves as an emulsifier and becomes a hydrophobic emollient having excellent water-resistant properties. Protameen Chemicals offers today’s chemist a variety of natural oils & Butters to accommodate the growing need for natural, plant derived ingrediants for cosmetic and personal care products. Working with prime producers and the growers themselves, Protameen is able to offer the highest quality natural ingredients. Protameen Fatty Alcohols are produced according to our exacting standards for consistency and purity. Fatty Alcohols perform as secondary emulsifiers, viscosity enhancers and opacifiers for a variety of personal care applications. They may also be used as base ingredients for anhydrous stick formulas. Protameen Fatty Acids are produced according to our exacting standards for consistency and purity. Fatty Acids act as emulsifiers and thickeners when neutralized, and may be used as superfatting agents and opacifiers in a variety of personal care applications. Protameen humectants are hygroscopic moisturizing agents used to absorb and retain moisture in skin and hair care formulas. They work by preventing moisture loss, and help attract ambient moisture to further enhance surface moisturisation. As Protameen Chemicals expands its product offerings, it continually seeks out unique chemicals specialties for use in cosmetic, personal care, pharmaceuticals and foods.